In Excel, a checkbox is an interactive tool that can be used to select or deselect an option. You must have seen it in many web form available online. You can use a checkbox in Excel to create interactive checklists, dynamic charts, and dashboards. 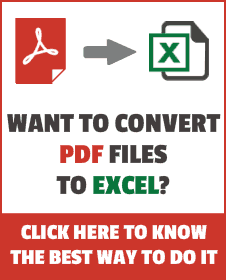 How to Insert a Checkbox in Excel. Examples of Using Checkboxes in Excel. How to Insert Multiple Checkboxes in Excel. How to Delete a Checkbox in Excel. 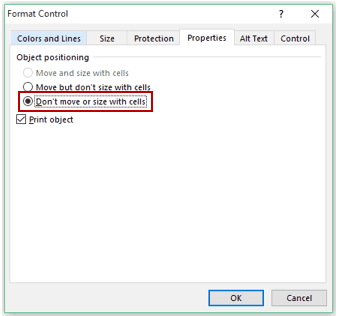 How to Fix the Position of a Checkbox in Excel. To insert a checkbox in Excel, you first need to have the Developer tab enabled in your workbook. Can’t see the developer tab? Don’t worry and keep reading! The first step in inserting a checkbox in Excel is to have the developer tab visible in the ribbons area. 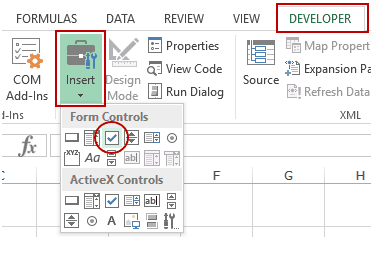 The developer tab contains the checkbox control that we need to use to insert a checkbox in Excel. Below are the steps for getting the developer tab in the Excel ribbon. Right click on any of the existing tabs in the Excel ribbon and select Customize the Ribbon. It opens the Excel Options dialog box. In the Excel Options dialog box, you will have the Customize the Ribbon options. On the right, within the Main Tabs pane, check the Developer option. Click OK. This will make the developer tab appear as one of the tabs in the ribbon. Now with the Developer tab visible, you get access to a variety of interactive controls. Go to Developer Tab –> Controls –> Insert –> Form Controls –> Check Box. Click anywhere in the worksheet, and it will insert a checkbox (as shown below). Now to need to link the checkbox to a cell in Excel. To do this, right-click on the checkbox and select Format Control. Cell Link: $A$1 (this is the cell linked to the checkbox). You can manually enter this or select the cell to get the reference. Now your checkbox is linked to cell A1, and when you check the checkbox, it will show TRUE in cell A1, and when you uncheck it, it will show FALSE. Here are a couple of examples where you can use a checkbox in Excel. Below is an example of a To-Do list that uses checkboxes to mark the task as complete. As soon as you check the checkbox for an item/task, the status changes to Done (from To be Done), the cell gets a green shade, and the text gets a strikethrough format. The value of the cell link for that checkbox changes from FALSE to TRUE. The ‘Task Completed’ and ‘% of Task Completed’ numbers (in cell H3 and H4) change based on how many tasks have been marked as completed. Have the activities listed in cell A2:A7. Insert checkboxes and place it in cell B2:B7. Link these checkboxes to cell E2:E7. There is no way to link all the checkboxes at one go. You’ll have to manually link each checkbox one by one. In cell C2, enter the following formula: =IF(E2,”Done”,”To Be Done”) and drag for all the cells (C2:C7). 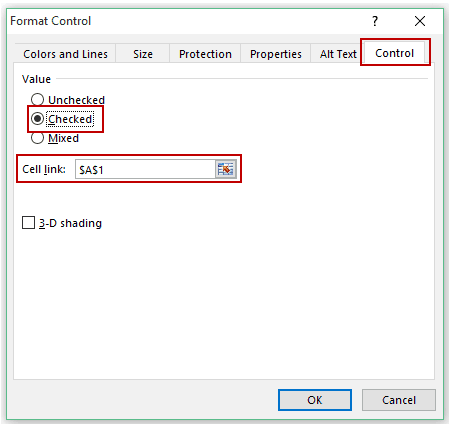 In cell C2:C7, apply conditional formatting to give the cell a green background color and strikethrough format when the value in the cell is Done. This will count the total numbers of tasks that have been marked as completed. This will show the percentage of tasks completed. In this case, the checkbox above the chart is linked to cell C7 and C8. If you check the checkbox for 2013, the value of cell C7 becomes TRUE. Similarly, if you check the checkbox in for 2014, the value of cell C8 becomes TRUE. The data used in creating this chart is in C11 to F13. The data for 2013 and 2014 is dependent on the linked cell (C7 and C8). If the value in cell C7 is TRUE, you see the values in C11:F11, else you see the #N/A error. Same is the case with data for 2014. Now based on which checkbox is checked, that data is shown as a line in the chart. Click here to download the dynamic chart template. There are a couple of ways you can insert multiple checkboxes in the same worksheet. To insert more than one checkbox, go to the Developer Tab –> Controls –> Insert –> Form Controls –> Check Box. Now when you click anywhere in the worksheet, it will insert a new checkbox. You can repeat the same process to insert multiple checkboxes in Excel. The checkbox inserted this way are not linked to any cell. You need to manually link all the checkboxes. The checkbox would have different caption names, such as Check Box 1 and Check Box 2, and so on. Select an existing checkbox, copy it and paste it. You can also use the keyboard shortcut (Control + D). The copied checkboxes are linked to the same cell as that of the original checkbox. You need to manually change the cell link for each checkbox. The caption names of all the copied checkboxes are the same. However, the backend name would be different (as these are separate objects). The caption names of all the new checkboxes are the same. However, the backend name would be different (as these are separate objects). All these checkboxes would be linked to the same cell (if you linked the first one). You need to manually change the link of all these one by one. You can easily delete a single checkbox by selecting it and pressing the delete key. To select a checkbox, you need to hold the Control key and the press the left button of the mouse. Hold the Control key and select all the ones that you want to delete. Go to Home –> Editing –> Find & Select –> Selection Pane. This will open a Selection Pane that will list all the objects on that worksheet (including checkboxes, shapes, and charts). Select all the checkboxes you want to delete (to select multiple checkboxes, hold the control key while selecting) and hit the delete key. Note that the names of the checkboxes here are the backend names and not the caption names. Note: The selection pane displays all the objects of the active worksheet only. 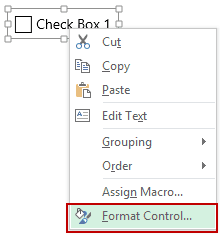 Left click on the checkbox and select Format Control. In the Format Control dialog box, select the properties tab. 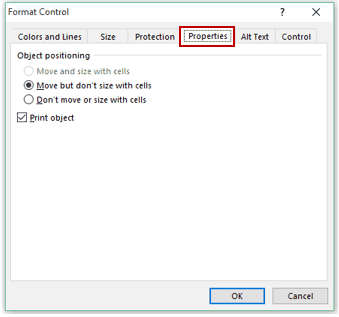 In the properties tab, within Object Positioning, select Don’t move or size with cells. Now when you resize or delete cells, the checkbox would stay put. When you insert a checkbox in Excel, you see a name in front of the box (such as Check Box 1 or Check Box 2). This text – in front of the box – is the Caption Name of the checkbox. To edit this text, right-click and select the ‘Edit Text’ option. 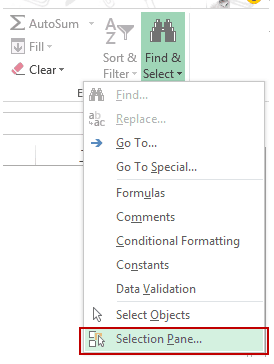 While you see the new text, in the backend, Excel continues to refer to this checkbox as Check Box 1. 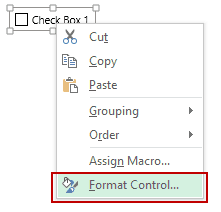 If you select the checkbox and look at the Name Box field, you will see the name Excel uses for this checkbox in the backend. 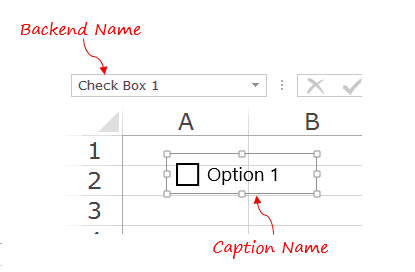 You can easily change this backend name by first selecting the checkbox in the worksheet and then typing the name in the name box (the naming rules are same as that of named ranges). See Also: How to Insert a Checkbox in Google Sheets. Create Dynamic Chart using Checkbox. 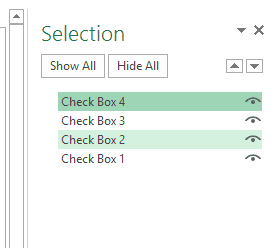 Create Checklists using Checkbox in Excel. VBA Guide to Using Checkboxes in Excel. How to Insert a Scroll Bar in Excel. 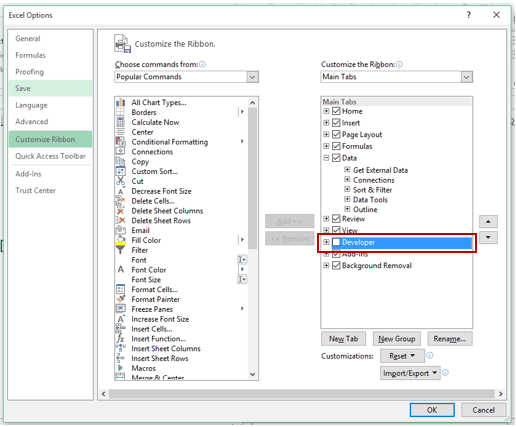 How to Insert and Use a Radio Button in Excel. Thank you Sumit – great tips and tutorials! I would like to find out if there’s a way to take this further. I want to create a spreadsheet with a row for each of the 50 United States. Each row would contain data specific to our industry in each state. I would like to insert a checkbox in each row. A user would check off the set of states involved in a transaction, and then click a “Filter” button, which would leave only the checked states columns visible. I would then want to create a report which would pull data only from the checked rows. Is this possible? Thanks again! how can you filter by check boxes? I have one column with check boxes and what if I would like to filter by the check boxes which have a tick and which doesn’t…? thanks Sumit. very useful tips. I have a question, I have an excel table, where I input my data in first 5 columns, next 3 have formulas which are Calculated automatically based on first 5 columns. Last 1 column has a check box which is linked to the cell. Now whenever I add another row in Table all formulas are copied from above table row with new range. but check box is not copied automatically. and if copy it manually and paste in new row. the new check box is also linked to the above cell instead of new row. I want it to copy automatically, same like formulas. I also want to be linked with the new row. Can you please advice me, how to do it? Thanks! very useful. Keep it up! Thanks for posting this. Big help! Keep it up! Sumit it very useful when you have to display data for more than 2-3 years its easy and cosmetic too.